Flying headfirst into a mound of snow, I had a small epiphany. “Why on earth did I ever think this was a good idea? 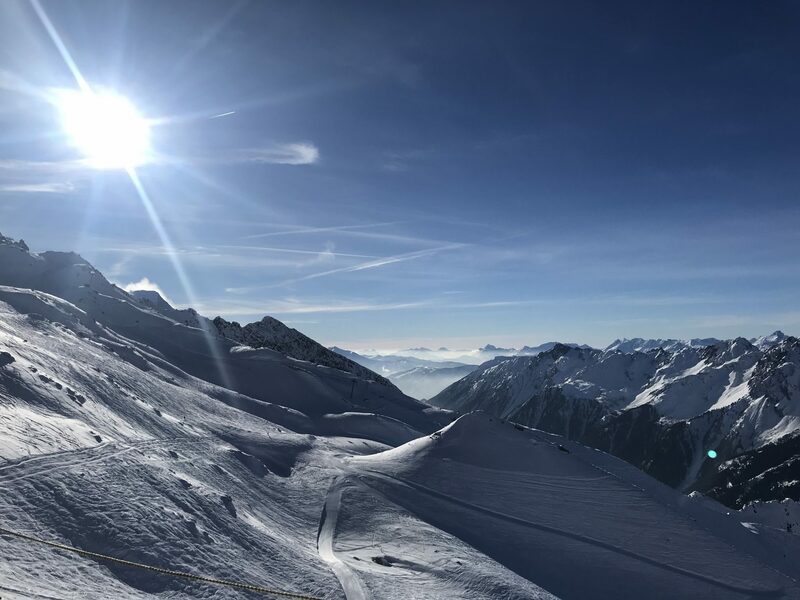 !” I was in the freeride capital of the world, Chamonix and, following a boost of perhaps overzealous self-confidence off piste, had just taken on a (albeit rather small) drop and ended up head over heels in the snow below. Yet, as soon as that thought hit my mind, it was gone in a flash and as I came to a halt I was smiling again. Why? Because I was in the midst of one of the best weekends’ skiing I’d ever had, doing things I would never have had the confidence to a couple of days ago and improving my skiing no end. I was taking part in Action Outdoors’ new 4-day Advanced Off Piste Course, based out of their Argentière centre. Though I’m a confident advanced skier and have ventured off piste many times in the past, the thought of heading to the freeride Mecca that is Chamonix for an intensive course had me in two minds. I’m so glad I took the plunge though and would recommend this experience to anyone considering it. Argentière is known as the adventure capital of the Alps and for good reason. 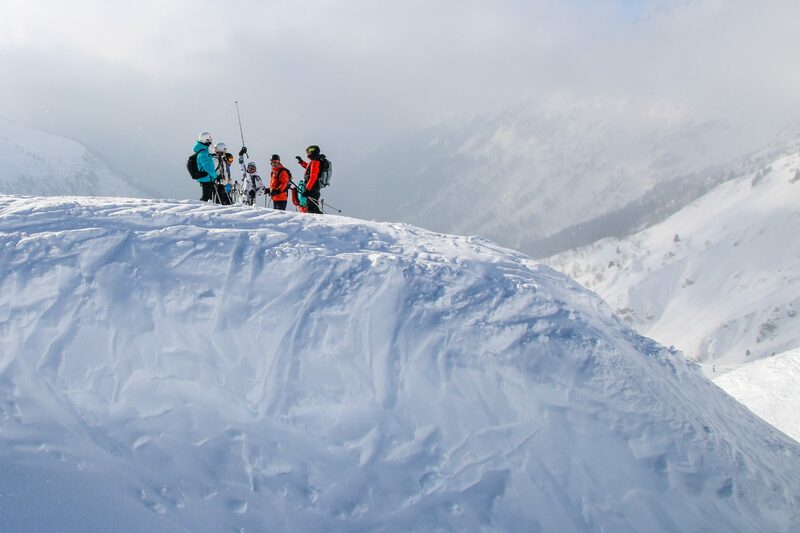 The area is renowned for having some of the best off piste in the world, so if you’re going to take on an off piste course, this is where you want to be! It’s set within the ski area of Chamonix, which consists of five ski areas, Le Tour, Grand Montets, Flegere, Brevent and Les Houches, all connected by regular buses. From the UCPA Hostel in Argentière, you can walk to the Plan Joran gondola, which whisks you up to Grand Montets, one of the most popular areas in no time. So how does the off piste course work? To give a brief overview, you check in on your arrival day at around 6pm and settle in in time for your evening meal. The next day you collect your equipment and lift pass before 9am (all done in house which makes the process extremely easy) and meet your instructor. You then have a full two days’ skiing with your instructor, followed by two days to enjoy and explore the rest of the area. The conditions on our first day were not fantastic in terms of visibility, so our instructor Flo took us up to the Le Tour area, where we could find some nice gentle off piste to find our feet, some more challenging routes for later in the day and some tree runs we could seek shelter in if the visibility took a turn for the worse. Before we set off, we were given some basic safety information about the current conditions and where we would be heading, and Flo ensured that everyone was fully informed on their avalanche safety equipment and how to use it. We then took a few runs on-piste so that Flo could see what he was dealing with and assess our technique. He gave us a few on-piste pointers where he felt we would benefit from them, before having us take on a few drills that were designed to get us prepared for heading off piste. We then headed off to take on some simple ‘side country’, working on the basics of off piste technique, with Flo providing invaluable advice. By the time we got to lunch, I already felt my technique was improving and that my confidence was growing. By the end of the day, we were all eagerly taking on tree runs and routes that some of us definitely would have looked at twice before. Another full day of skiing with your instructor, working on your technique and exploring the legendary skiing Chamonix has to offer. 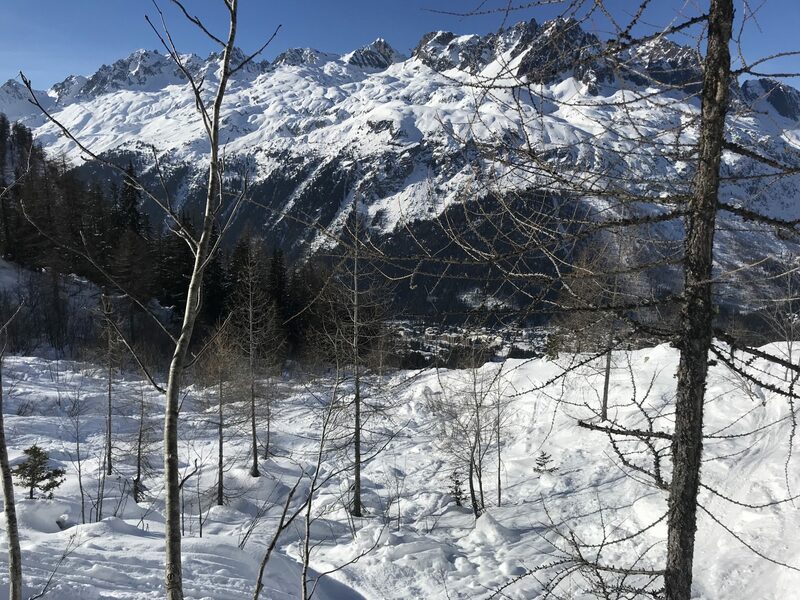 We headed up to the famous Grand Montets area, which is renowned as one of Chamonix’s most popular spots, with fantastic skiing opportunities at every turn and unparalleled views across the valley. On this day, our focus was on steeper terrain, learning techniques to best take on more challenging slopes and those oh-so loveable moguls! It was another hugely enjoyable day’s skiing and it was fantastic to have Flo skiing with us, as he was able to show us the best spots on the mountain and able to challenge us to terrain we may not have known we were able to conquer! Indeed, the day ended with a mogul field the likes of which I had never seen before, but I think it’s the first time in my life I’ve actually ever enjoyed skiing the bumps…! Throughout both days, Flo was great at answering any questions we had, encouraging us to push ourselves and constantly educating us about the mountains and mountain safety. Our group of six was of fairly mixed ability and I did feel that a couple of the more expert skiers with more experience off piste didn’t benefit as much from the experience as the rest of us, but UCPA offers a range of more expert courses too, so I’m sure they would choose to book onto one of these next time! If you’re already extremely confident off piste and have no qualms about heading off into the backcountry, this probably isn’t the course for you. But if you’re someone who enjoys the odd bit of off piste without being wholly confident in your technique or your ability to take on more challenging terrain, this course is perfect. What’s nice about the Action Outdoors course is that you have a couple of days to simply explore and enjoy the area yourself, so you can take all your new skills and implement them on the areas you haven’t visited yet, or return to your favourite runs. You can also use this time to visit the Aiguille du Midi, a must-do in Chamonix, especially because it is free for UCPA guests (a trip up usually costs around €60!). The views from here are absolutely spectacular and it’s an epic place to watch some of the area’s best freeriders take on the terrain below. I honestly can’t stress enough how much I gained from even just four days on this course. Sure, it was a lot to learn in the first two days, which was quite intense – my legs have never burned so much after just two days! However, for a short ski getaway, it was great to actually see a difference in my skiing. My confidence has definitely gone up a notch and I’m now raring to go on runs I may have been too scared of before. If you’re looking to improve your technique and as importantly, improve your confidence off piste, I can’t recommend this course enough. So, what were the top tips we received for skiing off piste? Of course, the key thing to remember when skiing off piste at any point is safety. Ensure you have all the necessary avalanche safety gear and you know how to use it, always let someone know where you are going and ensure you are not skiing in a dangerous area depending on conditions. Try to keep your weight over the middle of your ski – not the back, as many people believe to be best when skiing off piste. With this off piste course, you stay in the UCPA hostel in Argentière. For anyone that might be thinking ‘that sounds great’ but is immediately put off by the idea of staying in a hostel, I get that. Admittedly, I was somewhat apprehensive at first, having never been on a winter holiday to a hostel I was unsure how this would be. However, I had heard glowing reviews of UCPA from friends and family, so I was sure it would be fine. It was not fine, it was fantastic. 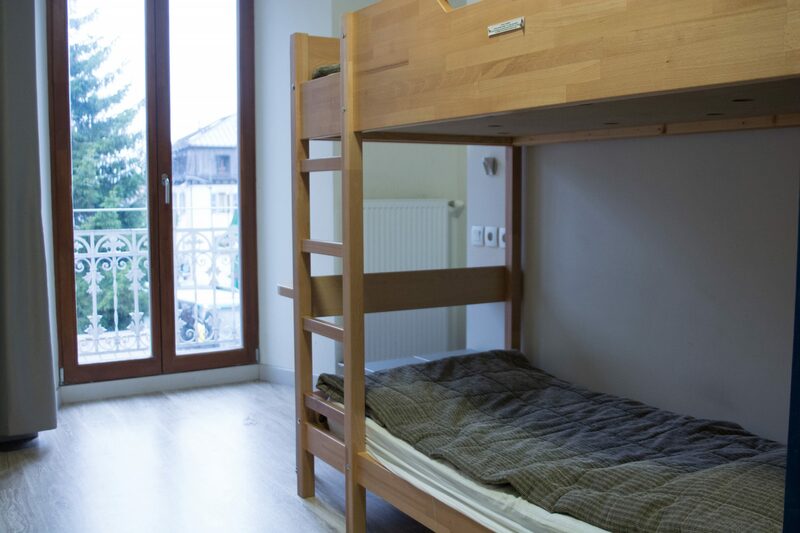 The Argentière hostel is a large Victorian building which was fully refurbished in 2013; well equipped and very clean, with a number of rooms sleeping two to six people. 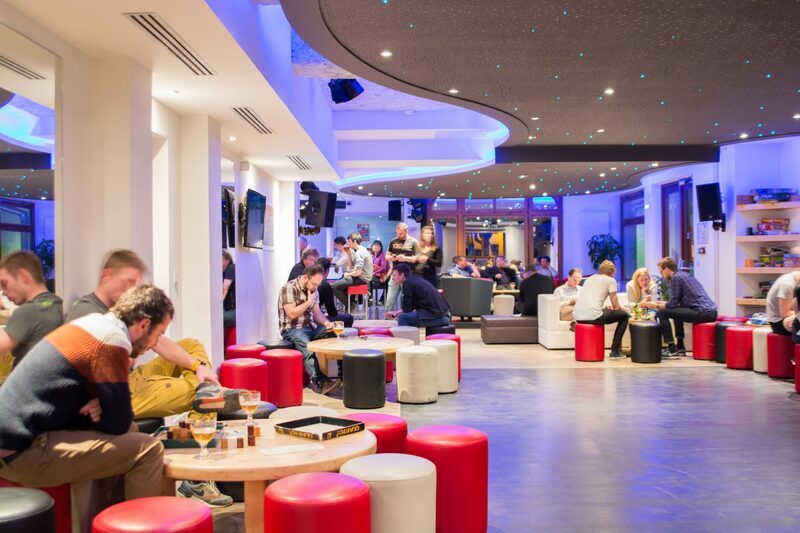 A large bar and lounge area, equipped with pool table and stage for live music provides the perfect place to relax after a day’s skiing and a great spot in which to socialise of an evening. 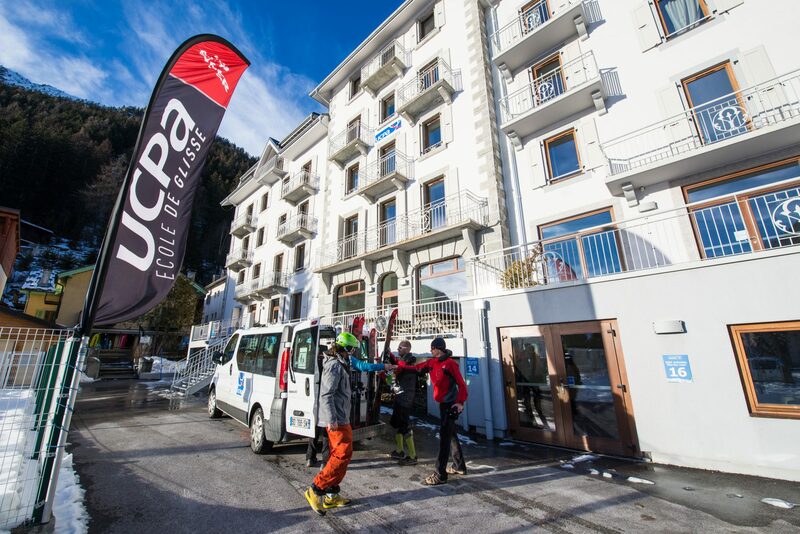 UCPA attracts many like-minded, sociable people, all of whom are there due to a shared love of skiing, which gives it a great atmosphere. 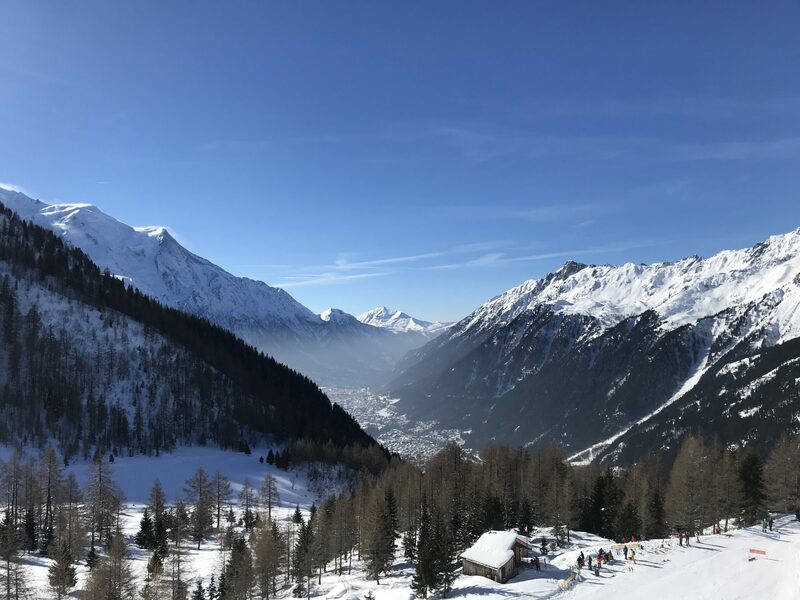 Most guests (42%) at UCPA Argentière are aged 25 – 35, so it’s definitely a good choice for young adults, particularly solo travellers looking to socialise. Indeed, solo travellers make up 27% of the hostel’s guests. Bathrooms are shared, with separated girls and boys’ bathrooms available as well as unisex facilities. Similarly, shower cubicles are available on each floor. They are basic, but very clean and really this is all you need! You do need to bring your own towels though – if not they are available to hire at reception. For anyone worried about valuable items, there are lockers available in each room, so bring a padlock if you will be sharing with strangers and have valuable items to stow away. The in-house ski shop makes life very easy. 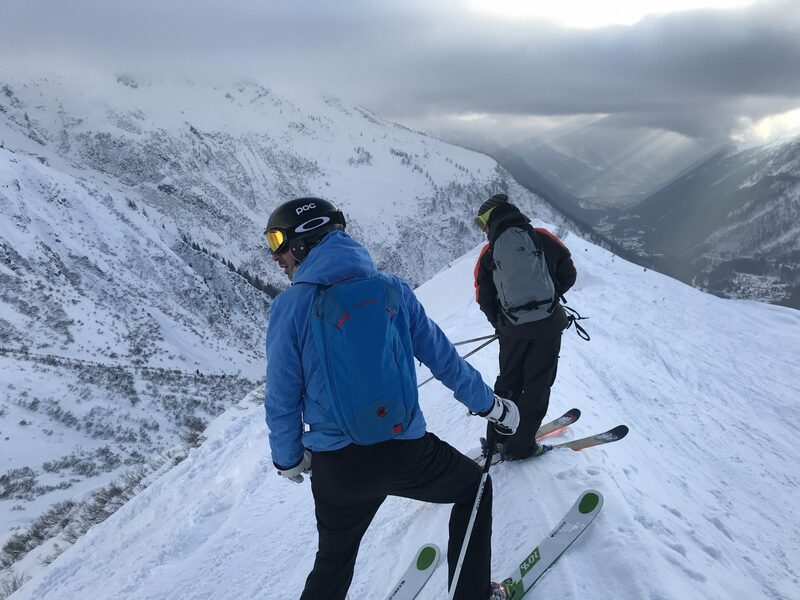 One of the great things about Action Outdoors is that ski equipment is all included in the price, so if you book an off piste course such as this, you are provided with the best quality equipment for a fraction of what you would pay independently. We were given Rossignol Sky 7 HD skis, which I absolutely loved. Designed for off piste but equally as impressive on piste, these were perfect for the type of course we were doing, which was predominantly off the groomed runs but did involve some piste skiing. You are also provided with a backpack, transceiver, shovel and probe, so you don’t have to worry about bringing any of this with you, to the delight of your baggage allowance! Meals are provided, with the breakfasts and dinners more than enough to fill hungry stomachs. They’ve even got a fully stocked sandwich station, so that you can make up your own baguettes to take up the hill. Everyone knows sandwiches taste 10x better on the mountain and the fact that you don’t have to fork out on expensive restaurant food just makes it taste even better. All in all, I was so impressed by UCPA. I arrived fairly unsure what the weekend would have in store and I left already planning my next trip back! If you’re someone that likes your luxury chalets, spas and table service, this may not be for you. But if you’re the type of skier that just wants to ski as much as possible, get the most out of your holiday for the best price and don’t mind pitching in a bit to make this happen, UCPA is absolutely perfect. Upon departure, you are expected to clean your room to the standard you found it, with cleaning products magically appearing outside your door on the morning of departure. The rooms are quite small and basic, so they do not take long to clean, hoover and mop, before collecting sheets to leave on the beds for the next guests. It’s good to know all of these things before you arrive, so that you are fully informed about the experience. However these little jobs are not difficult at all, but it all helps to create an atmosphere of community and of course also helps keep UCPA running at such incredible value. Action Outdoors are the UK agent of UCPA. For more information, head to: www.action-outdoors.co.uk or for the exact course we did, click here.